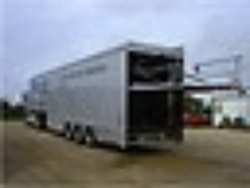 1 of a kind: 3.6m Hospitality and storage trailer, with awning and flooring. 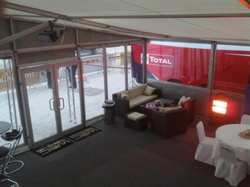 This unit has a large 8 x 12m awning with solid panels, which opens up to a 114 square meter shop/hospitality unit. The main unit has a large office with a meeting desk at far end. The unit has got a full car lift to the rear with double large deck storage to the rear which means that it can store its own awning and any display items all with in the truck. 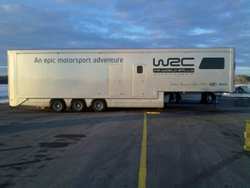 This has been used as the Tour trailer for Evil Kneville and more recently for the WRC as a merchandise unit. 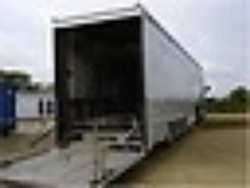 It is a one of a kind trailer and would suit a wide variety of uses. 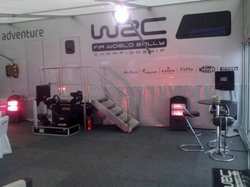 It makes a perfect portable shopping village or a great hospitality unit. Air-conditioning to front office with desks and meeting room.